The humble Dronbot, or basically any equivalent remote from other factions (Yaokong, Zonds, etc. ), are a broad range of remotes with vastly differing capabilities. From inexpensive defensive flash pulse toting Fugazi, to the more aggressive Sierra, there is practically a remote for every situation. For the sake of reference, I'm going to go by their PanOceania name, but the same comments apply to all factions basic remotes. It is worth noting though that there are some minor differences, like the Nomad's access to Climbing Plus (which is a really big deal), or the Q-Drone's Mimetism (which is also amazing). Generally though, they all fill the same purposes. The Clipper Dronbot is an example of your standard smart missile toting remote. The profile above however is from Druze, which also can take a standard missile launcher option (as well as Ikari Company). Smart missile launchers are incredibly accurate weapons, and the platform which you take them on is very inexpensive for their potential destructive output. The caveat however is that they are best used in conjunction with a Forward Observer against a Targeted enemy. When firing directly, they have the same +3 range as the standard missile launcher, but no -3 ranges, and DA+AP instead of EXP, though are still Burst 1. It is the low burst that makes this weapon unreliable in a face-to-face shoot out, which is where it's Guided ammo comes in handy. 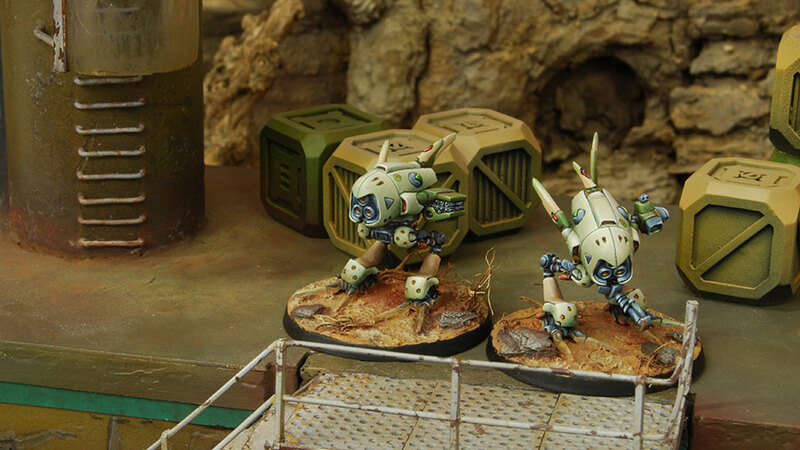 Using a Forward Observer to apply the Targeted state to an enemy turns this bot into a deadly foe. Once Targeted, this beast is hitting on 18's anywhere on the table, and provided you're out of LOF (as you should be) your enemy will be dodging at PH-3 (-9 for TAGs). The viability of a Clipper, or similar remote in most factions is going to come down to order efficiency. Armies like Yu Jing, and Haqqislam, who have cheap, or efficient ways of getting an enemy into the Targeted state are going to do better with a Smart Missile, than more elite armies like Aleph and Combined. For Druze and Ikari however, things change quite a bit. Adding a Clipper to a Fireteam does a ton to improve it's potential. Having the link bonus, on top of Assisted Fire supportware means that you can have a Clipper hitting with a missile launcher, at B2, hitting on 18's. This is a totally different machine now! Even without the 5-man bonus, you can add a Clipper to a Haris of Wu Ming and give them some very threatening firepower to play with. The amazing Fugazi, R-Drone, Lamdeh, or whatever you call it in your army. It may not look terribly impressive on paper, but on the table, these are extremely obnoxious. Their value comes in a couple different places, first however is their incredibly low cost to get another regular order on the table. Using remotes like the Fugazi to bulk out lists is a fantastic choice for armies that are trying to squeeze in a couple more orders. Defensively, they can really crap in your opponent's Cheerios, with a WIP13 flash pulse, backed up by mimetism, they have a solid 24" effective range, and can catch enemy combi rifles with a -9 penalty to be shot back at (with --3 range, mimetism, cover). If you want to get really dirty, and have access to several of these remotes, an EVO repeater can make them all Burst 2 with Overclock. Also, don't forget about sniffers! Even if you don't have a Sensor on the table, they can be dropped to prevent enemies from entering camo state near them. Between the sniffer and repeater, Fugazi do a great job extending the effective range of both hackers and sensors. A common sight in lists of veteran players, the Pathfinder brings a wide range of equipment and capabilities to the table. Sometimes referred to as a Swiss Army bot, and for good reason. They're competent in a gun fight (thanks to Assisted Fire), are fast-moving specialists, can use Triangulated Fire to pick out hard to reach enemies, reveal hidden enemies, deactivate mines or repeaters, and target foes for bombardment with smart missiles. If you're using one and you don't think it's pulling it's weight, then you need more practice with it! There's so much to write about sat-lock and sensor alone, that I've written an entire article dedicated to their use: Infinity Tactics 101: Sensor, Sniffer, and Sat-Lock. For the Druze and Ikari, they are a valuable fast moving Forward Observer, I suspect you'll see one in nearly every Ikari list, and I use them frequently in my Druze. There really isn't a whole lot to complain about with a 6-4 specialist of any kind. One last thing is don't forget to go into suppressive fire, with assisted fire you'll be ignoring cover and causing shock, which will make your opponent think twice before engaging. The classic "TR Bot" or total reaction remote, these are a no-nonsense chassis with just the gear it needs to be a thorn in the side of all that face it. On the surface, they're fast, and incredibly defensive with both a 360° Visor and Total Reaction. Any enemy that comes across it is likely going to be eating a face full of bullets. To make things even better, apply Assisted Fire and you'll ignore the -3 to hit penalty for cover, and cause shock! Don't let Total Reaction and the 360° Visor fool you into thinking that this remote is purely for defensive use, with the aforementioned Assisted Fire, this is an incredibly effective active turn murder machine. Can you believe that they let some factions have 2 or even 3 of them? As I've mention, and I'm sure you've gathered by now, these remotes perform a wide variety of jobs on the table. Despite needing a hacker to be added to a list, that is a small price to pay, since many of them receive huge benefits from the hackers presence. The Pathfinder holds a special place in my heart in particular. If you know you're facing some dastardly Oniwaban, performing a precursory sensor sweep before moving up with other units can be the difference between life and death for your Lieutenant (or TAG, or anything else valuable).